When your plumbing backs up and into the house, it can be hard to tell if you should contact a plumber or a septic maintenance provider. Although plumbers and septic maintenance providers may seem to deal with the same type of septic system problems, the truth is these two businesses do not overlap; a plumber does not have the knowledge required to fix septic systems, and we are not equipped to resolve plumbing issues. Here’s a quick video from Chad with some tips on how to know when to call a septic system maintenance provider like Van Delden or a plumber when your plumbing begins to back up. 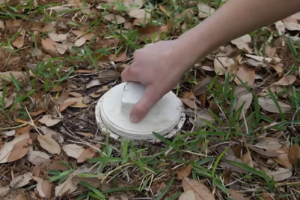 If you are experiencing septic backup, try checking the septic system’s cleanout. The septic systems cleanout is the short PVC pipe with removable cap that sticks out of the ground between your house and the septic tank. If you do not see any backup in the septic cleanout, we recommend you contact a plumber, as this is an indicator that the wastewater from your home is not making it to the cleanout. If the cleanout does contain backup, it could be from the septic system or it could be a blockage between the cleanout and the tank. In this case there’s a 50% chance you need a plumber, and a 50% chance you need a septic maintenance provider. If your septic tank is exposed, or if you are willing to dig up the lid of the tank, try looking directly into the tank to see if the liquid level is normal or overfull. Normal liquid levels indicate you should call a plumber; an overfull tank means you should contact a septic company. If you do not have a cleanout or cannot check your septic tank’s liquid levels, there is no way of knowing for certain which service is needed; however, your septic system’s age can help you determine who you should be calling for the issue at hand. The average life of a septic system is approximately 25 years, depending on its usage and maintenance. If your septic system is newer, you may want to consider calling a plumber before you call a septic system maintenance provider. If your septic system is older, there is a greater chance you are experiencing a problem that is directly related to your septic system. Having problems with your septic tank? Sign up for a free phone consultation with a septic system specialist. No sales pitches, just answers to your septic system questions and concerns — we promise! Call us today at 830.249.4000 (Boerne) or 210.698.2000 (San Antonio). I have standing water in 2 of my bathroom’s tub/shower. I had the septic system pumped out yesterday so I know that isn’t the problem. It seems to flow freely when tested before the technician left. What should I do? If you tank was just pumped yesterday, then it likely has not filled back up yet to the point where water would flow to the drainfield. So if you are continuing to have a backup in the house, it sounds like a plumbing issue. I would suggest contacting a plumber to investigate further. Have a septic system that was pumped 7 months ago. Yesterday the clean out caps came off and had waste from toilets all over ground by 2 bathrooms. There was standing water in each clean out and clean out by septic. This morning there is no standing water. My first reaction is the tank is full again and there is an issue with my leach lines. Does this sound like my tank is full? It’s hard to say without opening the tank lid and knowing where each cleanout is located. Its possible you had a blockage between the house and the tank. Or it could be that the system was backing up but since you likely didn’t use much water overnight, the system had time to absorb the water. Are any of the cleanouts located past the tank? If you have a cleanout past the tank that was overflowing, then that means the drainfield wasn’t working. Check for leaking faucets, running commodes, etc. that could cause a system to flood out. You may just want to keep an eye on it to see if it happens during high-water use times. Otherwise, I recommend calling either a plumber or septic company, depending on where you want to start. It could still be a 50/50 chance one way or the other (unless cleanouts PAST the tank were overflowing – that is definitely an issue with the septic system). My upstairs toilet and tub are backed up. When I plunged the toilet, all the water just backed up into the tub. We had this same issue about 6months ago and had a plumber remove the toilet from the floor and snaked it. It seemed to work fine but now it’s happening again. We have a septic system and I’m assuming we have an external clean-out by the tank but haven’t check it. No other toilets in the house are backed up though. Do you think there’s something more serious going on other than just the typical back up? And if so, do you think they can clear it out using the external clean out rather than having to remove the toilet again? I’m thinking he may have done it this way before because the toilet’s on the second floor and that access was closer to the problem/maybe he didn’t know where the external clean out was? I have no idea:( Just hate the idea of having to clean this the same way without addressing an underlying issue. Well, I’m not a plumber, so I can’t say what the best route is for them to investigate the backup. However, since the backup is localized to the upstairs facilities, it would be extremely unlikely that the back up is due to your septic system. If you had the plumbing for the toilet snaked out 6 months ago and you are having the same problem again, you may want to consider having the plumber use a camera to determine what is causing the problem so that you are better informed of the best way to correct it. My toilets are backing up into the shower, the septic tank has been emptied about a month ago…If I open the cleanout under the house everything goes down and is ok for about 5-10 flushes then it happens again. What could be the problem? It could either be your system is backing up (your tank fills back up within a week usually) because the drain field may not be working correctly, or you might have a blockage. I’d call the septic cleaning company and ask if the level in the tank was normal, or overfull (backed up). If it was backed up before, then that’s probably your issue again. If it was not backed up before, then you might want to call a plumber first. It sounds like you might have a plumbing blockage. Have you tried calling a plumber? Had our tank pumped abut 7 months ago give or take. We have 2 bathrooms here and the one works fin but the other flushes fine in the morning and then as the day goes on it doesn’t want to flush at all. We plunge it and it’ll go down but we hear gurgling in the sink. Tank has water above where the grease trap/ filter is…about 4 inches or so…any thoughts or advice is appreciated. Are you home all day? When you sleep at night and no one is using any water in the house, the system may have time to allow the wastewater to percolate in the soil. But when you are at home and using water (adding water to the system), it sounds like it cant handle that water. If you have water over your tank, that is a sign that your septic system may be the culprit vs a plumbing blockage. For the past month or so, we have been having a slow toilet drain in both the toilets. The water will rise and stay risen for a couple of hours and then drain slowly but the content in the toilet remain there. We have a septic system and had it pumped a year ago. We checked the main tank but doesn’t look like there’s any blockage. Not sure what to do at this point. Any advise would be appreciated. Have you had a plumber out to determine there is no blockage in the plumbing, and that the pipe from the house to the tank is clear? Does it happen every time you flush, or just when there have been periods of higher usage in the home? It happens every time we flush in both toilets. I wasn’t sure if I should contact a plumber or someone who deals with septic tanks. I’m a first time homeowner so this is all new to me! If you only have 1/4″ of standing liquids in the cleanout at the same time that your drains are running slowly, then my guess is that you might just have some clogged drains….but no guarantee until its really checked by a professional. Are these slow drains the ones closest to the cleanout/tank? If not, then the changes are better that its clogged drains or a blockage in the plumbing. Sometimes a lack of fall in the pipe between the house and tank or a belly could cause a little standing liquids. In most cases, if the septic system is backing up that bad towards the house, then your cleanout would likely be completely backed up as well. I hope that helps. If your toilet back-up seemed to dissipate right after the tank was pumped, but is starting to happen again, it sounds like your drain field is not accepting the amount of water that you are using. You also mentioned you had backup into the yard…do you mean liquids were surfacing over the tank or drain field? if so, this is another sign that your system is not working properly. See the link below for further information as well. We have a clubhouse. Every time we leave and dont come back for awhile the toilet has waste in it. We just flush and it fine. Is this normal? I can’t say I’ve heard of that before. That’s pretty odd especially if no one is using the system. Maybe someone is playing a prank on you? Where would I find my clean out at. I believe I saw one when I moved in 10 years ago but I can’t remember where. The cleanout is usually between the house and the tank. Most cleanouts are 4″ PVC with a cap. You might want to contact your local septic department to see if there is a permitted drawing of your system, which may indicate the cleanout location (but even then, drawings are not always accurate). I’ve lived at my house for a year now. When I first moved in the landlord told me not to flush toilets paper down unless I got number 2. 2 months after I moved in my toilet didn’t want to flush or it would take forever for it to go down. I went out and took the overflow cap off to let it drain and kept filling up totes of water and let my tub and sinks run to see if it would get a clog out. I also used a snake and it helped for a little while. It all of a sudden started back up again. I was and still am scared to telly landlord that it messing up. I then kept the lid off for month and just cleaned up the message out side. Well the other day I washed a few loads of laundry and went to go mow the yard and the area was dry and I looked down the pipe and it was as dry as could be. Would anyone have any idea where the water could possibly be going. I don’t have a basement or crawl space under my house nor is there any other wet areas around my house. Perhaps there was a blockage that is now clear? Have you used less water than previously? We moved into our house about 5 months ago, we had the tank cleaned out shortly after moving here. We tend to have at least a week or two of our septic and pluming working just fine. This includes 5 people being home during he day, laundry and dishwasher being run for a total of 6 people in the home, not to mention toilet flushes and showers/baths… But then suddenly it starts to back up into the tub and shower in both bathrooms. And sometimes the toilets don’t want to flush/drain. If we let it sit for about 12-24 hours it seems to resolve for another week or two and then it gets backed up again if I just run one load of dishes or laundry that day and so on and so forth. Can you tell me you think may be the problem? Our pump was said to be working just fine and the sprayer heads I think need to be replaced but could this just be an issue of sprayer heads? So, is this an aerobic system? The answer to your question depends on your system type. If its an aerobic system, some thoughts are: a blockage between the house and tank, if your system is on a timer and you use too much water, possibly parts that work intermittently (pump, floats, control board). You really should have a professional check the system if its an aerobic system. Our septic backed up tonight. I checked tank one and it is overfull, but I can hear it moving into the second tank. Looked in the second tank and it doesn’t seem very full. We had the tanks pumped within the last year and last time the septic guy said there was a wet wipe between the two tanks blocking it and the motor burnt out as a result. In checking the two tanks, I don’t hear the motor he replaced running at all. I’d call him back out. It could be another blockage, or it could be an electrical component (pump, float, wiring, control board, etc). If its the pump that pumps water to the system, perhaps the pump was not activated at the time you checked it. Not sure which pump you are referring to. The submersible pump does not run constantly, however, an aerator pump should. I just had my septic tank pumped today 9/7 due to thinking it was backing up into the basement. When we got home we flushed the toliet a few times to make sure it wasn’t going to back up again and it backed up. Now it smells in the basement and I’m not sure what could be going on. If you pumped your septic tank today, the tank shouldn’t be filled enough to cause backup. That leads me to believe you might have a plumbing issue, or an issue in the pipe between the house and the tank. We don’t have basements here in Texas, so I’m not familiar enough to address that part. My suggestion is to call a plumber at this point. I’ve read through all the comments and I think my situation is similar to some of the ones listed, but since you do such a nice job of answering these posts, I’ll add my situation: I had both my septic tanks pumped for the first time in 23-years after a backup from flushing the upstairs commode caused an overflow in my downstairs commode. The gray tank looked like it was only 8″ to 12″ from the top, but the black tank was filled to the top. The pumping of each tank occurred three days ago. Now, three days later, I am unable to flush the downstairs commode (and thus I am not even touching the upstairs commode.) Is it safe to say that the black tank has not filled after three days? And that the problem could be something between the house and black tank? Thoughts? Thanks for your time. Well, it could be a blockage either in the plumbing or in the sewer line between the house and tank. If it IS septic system related, then you might have a problem with your drainfield. Have you inquired with the person who pumped it to get their thoughts since they saw your tank first hand? Do you have 2 separate tanks? Is one for toilets and the other for greywater? Or, are you referring to a two compartment tank where most of the solids are in the first compartment and mostly liquid in the second compartment? Or two tanks in series with mostly solids in the first and mostly solids in the second? There are so many ways to say different things…a little clarification is needed. We’ve lived in our house for five years. When we moved in we had the septic pumped and then two years later they came back to check it again to give us an idea of how often to pump. They determined we should pump every two years. It has only been one year since then but all of a sudden, 3 days ago, after the shower had been running, we heard a gurgling sound and our downstairs toilet filled up to almost overflowing. It had rained a lot the day before. We stopped using any water and a couple hours later it had drained. Continued using water normally and it was fine until this morning. Again it rained a lot yesterday. This morning we woke up to black water filling the toilet and the sink in only one bathroom. This is the bathroom closest to the septic. As we had been asleep no one had used this bathroom all night. However, we had run the shower and toilets in the upstairs bathroom earlier that morning. Reading through the comments here it is tough to tell if this might be a drain field or drain/vent pipe issue. Thoughts? There’s really not a way to know just by reading other comments or situations. Each system and circumstance may be very different. When you are having the back up, I would open the tank and see if the liquid level is to the top of the tank. If it is, then this would point to an issue with the septic system. If it is not, then that may point to a blockage in the plumbing or in the pipe between the house and the tank. The liquid level can fluctuate above it’s normal level depending on usage and rain. So, if you check the tank while you are not having backup, and the level happens to be normal at that time in the tank, then that might not give you the correct answer. Pumping the tank will remove the water and wastewater from the tank only. But the tank will re-fill as soon as you use water in the house. So, normally, within a few days the tank is filled back to its normal level and liquids start flowing to the drainfield again. I’ve seen heavy rains cause backup in systems even when the system is not in use because the drainfield gets saturated and that water starts flowing backwards into the tank – just following the path of least resistance if the absorption trenches are flooded. I hope this helps a little, but without investigating it further, there’s just no way to know. I’m having trouble with my septic. The septic is full of water not so much waste. Water comes in to the shower when I flush the toilet. I used a snake and can’t find any resistance it goes in pretty far. No water on the drain fields it’s all dry. I have a sunken shower it’s about 2 feet below the floor level. I’m wondering if gravity could be the problem. But it worked fine for 2 years. Have you had a plumber check the plumbing for a possible blockage? If the plumbing is clear then it may be from your septic system. You won’t know until you have a professional investigate further. It may be a process of elimination. My pvc pipes fills up and slow to go down. I had the system pump maybe 3 months ago. One toilet fills up after flushing. If your drainfield is not accepting/absorbing wastewater, then what you are experiencing may be the symptom of that. If so, pumping the tank will not solve the problem long term, but may help short term. Have you verified that you do not have a plumbing issue or a blockage in the pipe between the house and the tank? Just bought a house last wk. After 3 days here started have issues with slow drains and toilets not flushing. Had septic people come out. Septic was full. Now 3 days later we are having the same issue. Septic is almost 40 yrs old. After a shower that is when we have the most issue’s. The septic was not over flowing but was at the top of the pipe. Could there be a problem with the fill in the yard? I do see a few lower levels of lines in the yard itself. Did you get a septic inspection done prior to purchasing the home? The average life of a septic system drainfield is about 25-30 years on average. So we have been having issues for atleast a month now with the toilet being backed up and whenever we shower the toilet bubbles we had someone come and pump the septic tank and all was good and literally 2 days later it’s back to the same way..might I add I’ve also been having problems with my washer around the same time the septic problem started happening I don’t know if it’s because of that or not but don’t know what to do! What kind of issue were you having with your washing machine? If too much water goes into the system it can flood it out. Once your tank is pumped it begins to fill until water begins to flow to the outlet pipe, so if your absorption is not accepting water, then it could be that your tank filled within a few days and the water has no where else to go. Have you verified everything is clear in the plumbing and the sewerline between the house and tank? When your tank was pumped, what was the liquid level in the tank? This can be a good indication of how your drainfield is working – if you don’t know, try calling the person who pumped your tank and ask more questions. How many people live there? How old is the system? We are in a new house, (1.5 years). We have one of two toilets that continue to backup. Over time the water goes down. When I shower or use sink in room of toilet I hear gurgling sounds from the toilet. Plunging does not seem to work. I checked cleanout and it has standing water near top. The other toilet and all sinks and tubs are fine. How do I know if this problem is from toilet to cleanout or from cleanout to septic. I am confused because how is waste from other toilet going down fine but have water in cleanout acting like the clog is from cleanout to septic. My first guess is that you may have a clog between the cleanout and tank since your house/system is less than 2 years old. Is the toilet that backs up the one closest to the tank? If so, then this would make sense. You’ll ether need to get a plumber out to check/clear a clog between the cleanout and tank, or have a septic company dig up the lid of the tank to see if the level in the tank is high/backed up. Its sometimes a 50/50 chance, but if it were me, I would start with a plumber. (UNLESS you have any sort of pump in your system (usually indicative by an alarm system) in which case your pump may not be operable.